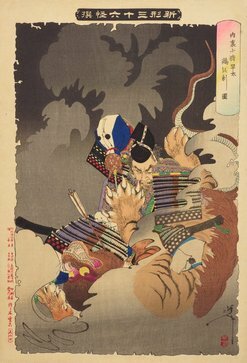 Tsukioka Yoshitoshi was considered one of the last great ukiyo-e designers before what was known as the modern period in Japan. 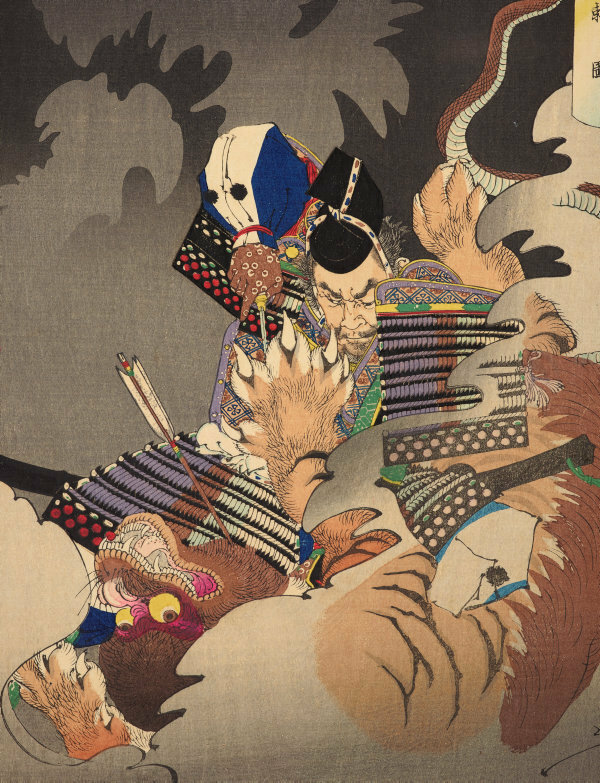 This work comes for the series 'New Forms of Thirty-six Ghosts' ('Shingata sanjurokkaisen') which Yoshitoshi produced in 1890. The story of the print 'Ii no Hayata killing a nue at the imperial palace' originally comes from the 'Tale of Heike' ('Heike Monogatari'), compiled prior to 1330, Book 4, Section 15 called ‘The Nightbird’. The story of the slaughter of a nue was first mentioned in this story where it was described as a supernatural creature with the head of monkey, the body of a badger, limbs of a tiger, the tail of a snake and the cry of a thrush. Il no Hayata was the retainer of the warrior and archer Minamoto Yorimasa (1106-80) who was called to the palace to assist Emperor Konoe (1139-55). Tormented by a black cloud which seemed to have settled over him, the emperor had nightmares and trouble sleeping. Yorimasa saw a strange shape in the cloud and shot into it. The nue was hit, suddenly fell from the cloud and the retainer Ii no Hayata, who was nearby, after a skirmish slayed the nue to death. This image in Yoshitoshi’s print is the encounter between the nue and Ii no Hayata.